We are to sustain and hearken to the President of the Church, who holds the keys of the holy priesthood and leads God’s Church on earth. 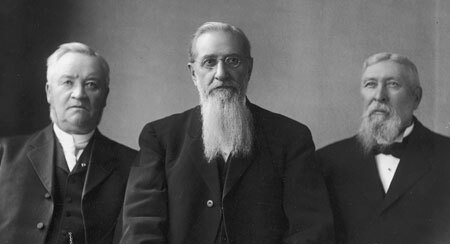 The First Presidency, April 1910 through October 1911 (left to right): Anthon H. Lund, Joseph F. Smith, John Henry Smith. God Himself leads His work and His people. Three presiding high priests stand at the head of the Church on earth. The President of the High Priesthood holds the keys of the holy priesthood. The Priesthood in general is the authority given to man to act for God. Every man ordained to any degree of the Priesthood, has this authority delegated to him. The President is appointed to receive revelations for the entire Church. God will honor and magnify His servants. Who leads the Church? Why is it important for us to understand that “no man will lead God’s people nor his work”? What blessings are promised to the members of the Church when they faithfully follow the President of the Church? (See also D&C 21:4–6.) In what ways have you been blessed by following the counsel of the living prophets? How can you sustain the First Presidency and the Quorum of the Twelve Apostles in their work? What do the “exalted titles” of prophet, seer, and revelator mean? To whom do these titles apply? What is the proper way to address or speak of the President of the Church? What are the keys of the priesthood? What does it mean to sustain the President of the Church as the only person on earth who possesses and is authorized to exercise all priesthood keys? Why is it vital to know that only the President of the Church is appointed to receive revelation for the entire Church? How can we guard against believing false prophets and false revelations? Why can we be assured that the President of the Church will always lead us according to God’s will? See Conference Report, Oct. 1901, 71. Gospel Doctrine, 5th ed. (1939), 169. In Conference Report, Oct. 1902, 87. In Conference Report, Apr. 1898, 69. In James R. Clark, comp, Messages of the First Presidency of The Church of Jesus Christ of Latter-day Saints, 6 vols. (1965–75), 4:248. Messages of the First Presidency, 4:307. Messages of the First Presidency, 4:270. Messages of the First Presidency, 4:154. In Conference Report, Oct. 1915, 6–7. In Conference Report, Apr. 1912, 137–38.